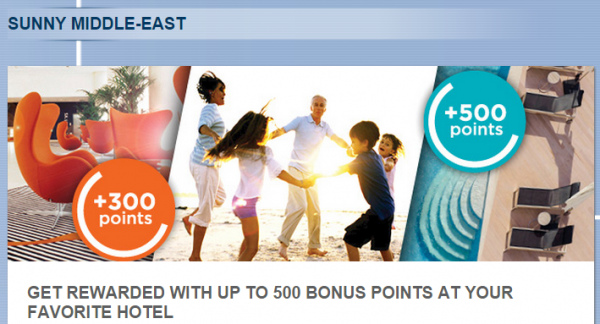 Le Club Accorhotels has a 300 to 500 bonus points offer for stays at select hotels in the Middle East between October 15 and December 31, 2014. The bonus is 300 points at ibis or ibis Styles hotels and 500 points at Novotel, Suite Novotel, Mercure or Adagio ones. Note that the terms indicate that the bonus points would only available on Best Available Rate bookings but then mentions Hot Deals as well. Could be one promo to consider if you are staying at any of the participating hotels in the Middle East during the promotional period. 1. General Le Club Accorhotels terms and conditions apply to the “Sunny Middle-east” offer. 2. This offer is valid for any best available rate (hot deals: RA3CCW) stay from 15/10/2014 to 31/12/2014 in one of the participating hotels in the Middle-East region, and booked between 01/10/2014 and 31/12/2014. 3. This offer entitles Le Club Accorhotels Loyalty members, regardless of their status, to benefit from earning 300 points in one of the participating ibis and ibis style hotels in the Middle-East or from earning 500 points in one of the participating Novotel, Mercure, Suite Novotel and Adagio hotels in the Middle-East. Previous articleReader Question: No Award Availability At The Holiday Inn Express Singapore Orchard Road Despite Standard Rooms For Sale?